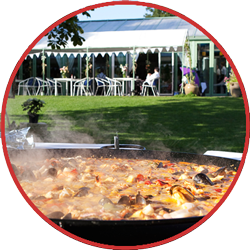 The paella party has become an increasingly popular way of catering for parties over the last few years. And it’s not just paella parties; there’s far greater demand these days for wedding catering that’s vibrant and colourful and less formal. Guests no longer want to sit down to a two- hour long, three-course meal where they get served a piece of poached salmon, some green beans and new potatoes. And that’s why big pan paellas are a spectacular way of catering for more festival-style weddings and parties where the food is a wonderful focal point. Hosting a paella party couldn’t be easier. We cook our paellas outside under our own gazebo and we’re completely self-sufficient in terms of power. So, whether you’re hosting a paella party for friends in your garden or catering for a wedding in a field with a tipi, paella parties are a great choice.